Today, located in Arizona at the border of Arizona and New Mexico at Interstate 40. 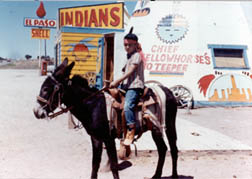 The Yellowhorse Family actively welcomes the traveling tourist from their Navajo-Owned trading post on the Navajo reservation. It all started in the 1950's from a roadside stand that the Yellowhorse family started selling Navajo rugs and petrified wood to the passer-by vacationers. Traveling the route 66 was an adventure in itself, and stops were far in between. So the need to stop and stretch along with the gnawing curiosity to meet with the Navajo family was the ingredient for success and great memories for everyone. 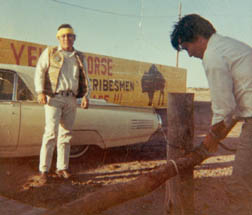 In the 60's, Juan and Frank Yellowhorse, tidy up some at the newly constructed trading post, not far from the rug stand. The addition of gas pumps selling Shell gas, and new signs along the Route 66, were constructed. Along with building their livelihoods, the young ambitious Yellowhorse's were teaching their own kids to talk and interact with the traveling tourist and vacationers. Frank's son David, Shown on his donkey, interacts with young vacationers of his age. Giving rides around the trading post for a quarter and trading stories with the young vacationers was his part in becoming an active part of the trading post. Thank you for visiting us here on the internet, what a great way to communicate with peoples from all over the world.